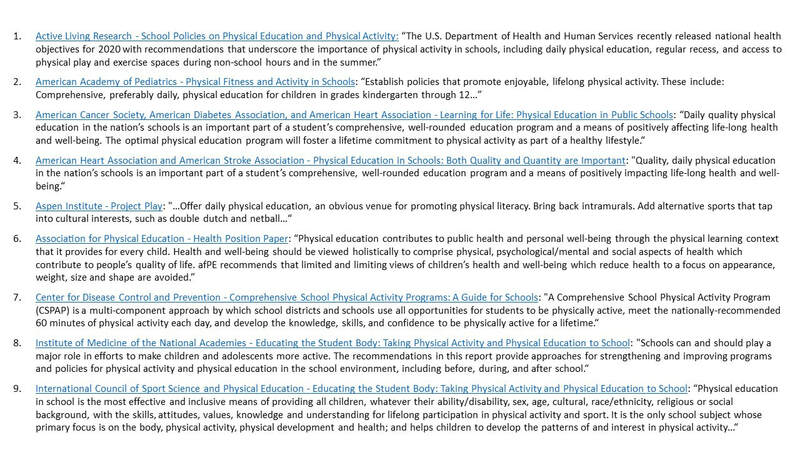 Of the many subjects children study in school, there may be none more important than physical education. However it must be of high quality and aligned with state/national standards and guidelines. A high quality physical education program offers children opportunities to develop the skills, concepts, and dispositions needed to be physically active for life. Sufficient, regular physical activity not only helps prevent major diseases but it also promotes learning; reduces stress, anxiety, and depression; and improves overall student wellness. It doesn’t matter if the child excels in every other subject in school and grows up to become a successful doctor/lawyer/engineer/etc., with poor health any professional achievement becomes secondary. There are many factors that contribute to the ease of implementing and sustaining a quality program, including the involvement of the administration, parents, and community. However it ultimately comes down to the willingness of the physical education teacher(s) to do their best no matter the situation (our REAL Teacher’s Pledge states this clearly). That being said, REAL teachers still need our support and appreciation. This can be in the form of equipment (every jump-rope, pedometer, heart-rate monitor, and home-made scoop catcher counts), classroom assistance, time and funding for professional development, and by advocating for quality physical education at the local, state, and national level. Our Documentary - No Excuses! Research indicates that one of the leading factors for participating in physical activity is one's confidence and self-efficacy (competence in one's abilities to perform a specific skill). This finding supports the need for attaining physical literacy in order to have the best chance at leading a physically active lifestyle. With each skill mastered, new opportunities for physical activity are opened. 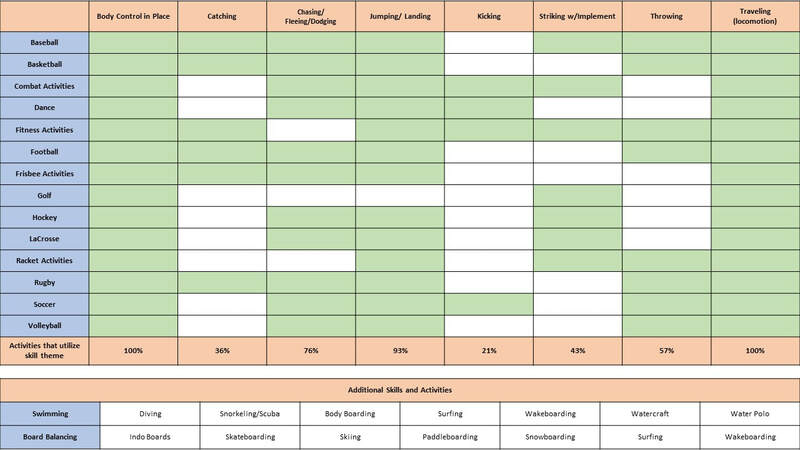 The table below lists some of the most utilized skill themes and what percentage of popular physical activities require them (table is based on Children Moving: A Reflective Approach to Teaching Physical Education, 2007). 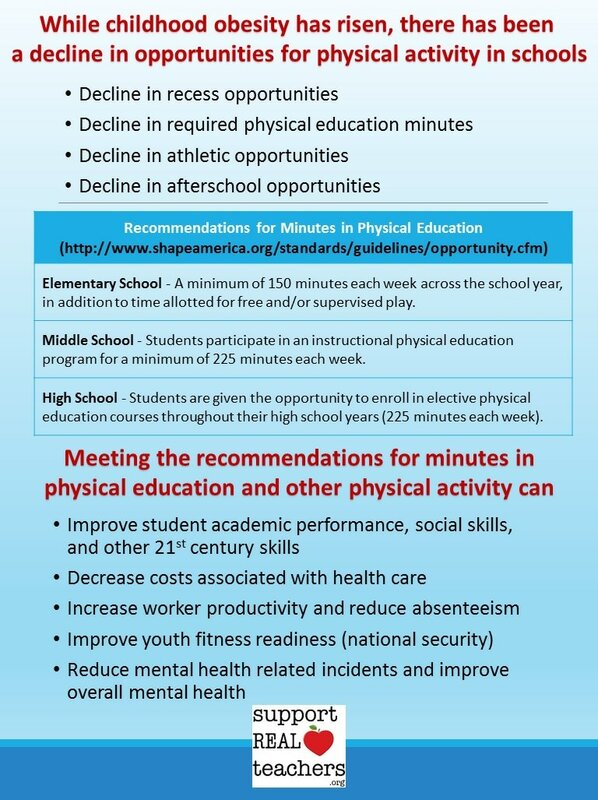 ​"SHAPE America recommends that schools provide 150 minutes of instructional physical education for elementary school children, and 225 minutes for middle and high school students per week for the entire school year. A quality physical education program provides learning opportunities, appropriate instruction, meaningful and challenging content and student and program assessment." 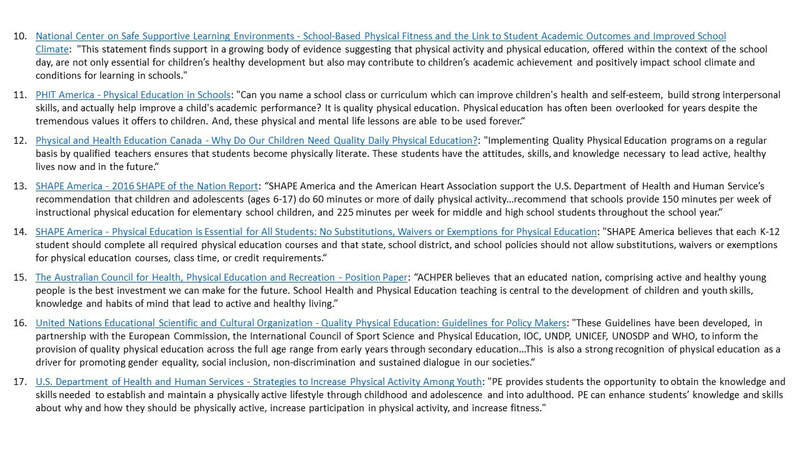 ​​Physical and Health Education Canada - Why Do Our Children Need Quality Daily Physical Education? Since physical education is standards based and much more than just physical activity (see What Does Quality Physical Education Look Like? ), it should NOT be substituted UNLESS the replacing course addresses the same standards. 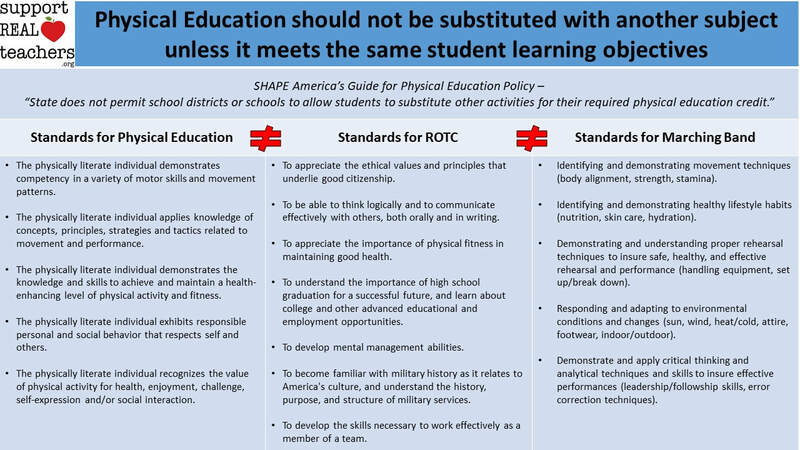 JROTC as a Substitute for PE: Really? ​Do the Duration and Frequency of Physical Education Predict Academic Achievement, Self-Concept, Social skills, Food consumption, and Body Mass Index? "This article presents the reasons that account for the need for quality physical education given the current trends of obesity and physical inactivity among youths and adults. The reasons presented are intended for physical educators to use when communicating the profession's scientific base to the general public." ​Why We Should not Cut P.E. ​SPARK: "A groundbreaking exploration of the connection between exercise and the brain’s performance that shows how even moderate exercise will supercharge mental circuits to beat stress, sharpen thinking, enhance memory, and much more." ​​The Effect of Physical Activity on Sleep Quality, Well-Being, and Affect in Academic Stress Periods.